Quickly followed by a phone call from another friend. She said her and her daughter turned to each other during the show and squealed "Rebecca!" Apparently many people watch Flipping Out on Bravo. Believe it or not, I have NEVER seen this particular home remodel show. I know. Shocking. 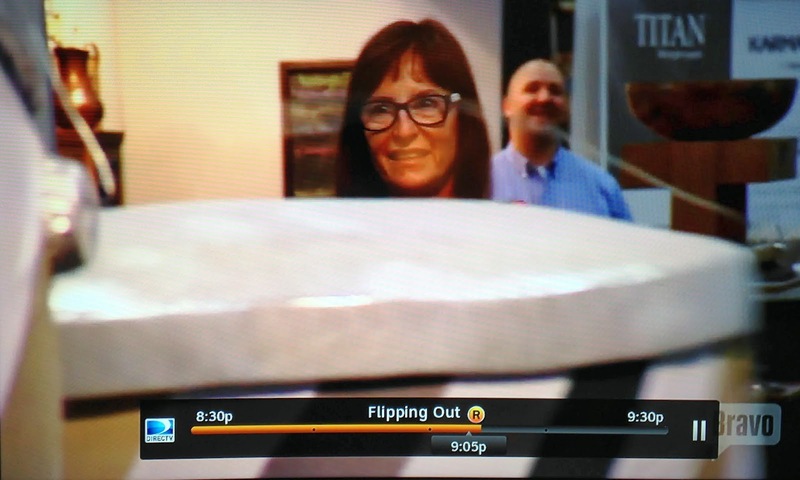 At the halfway point in the show, you can see me. In fact, I think they actually focus in on me (she says modestly). The scene was filmed at last year's Dwell on Design. I even blogged about the paint cans featured at the booth. If memory serves me right, I walked right into a shoot (so Jeff's weird dancing paint cans worked, as discussed in the show). An LA hipster film crew member pulled me aside immediately and had me sign a release. I had no idea what was going on. I'll show you my once second of fame in slow motion. Seriously? Someone owes me another 14 minutes 59 seconds. Do you watch Flipping Out? I had never seen it until my accidental moment of non-stardom. My friend Kathy, of the text above, says she has followed the show forever and that Jeff Lewis is a genius and if it had been her, she "would have been all over Jeff Lewis asking questions and buying paint." I'll have to watch some old shows where they actually flip houses. P.S. It is almost time for Dwell on Design again! It will be held June 20-22 at the LA Convention Center. And of course I am going. I've never watched the show either...but now that you're a big star, I'll have to start. ;) Really, it's pretty cool to see your bit of fame on TV. We all gathered around the TV like it had just been invented when my daughter's Fabpats were featured on Home by Novogratz, and it was just framed pictures, not even her. You look great in your 1 second of fame...hair and makeup lookin' good!!! I agree that it should be officially noted that you're due the 14 minutes 59 seconds at a time and place of your choosing. If I were to stumble into a TV show, I'm sure I'd be without makeup, desperately needing a haircut and with a big cold sore on my lip. The whole thing made me giggle. I have never been on TV so I'll guess I'll take it. The fact that two friends even spotted me during the one second is kind of amazing. Ha - a star is born! Very cool, but asked to sign a release for 1 second? What a sad corporate world we live in... Hipsters, all of you! Dang it! I was there too and missed it--probably somewhere else gathering free giveaways. I know, right? You were literally standing next to me. Or had you wandered off. Again. Didn't Andy Warhol say we'll all be famous in the future? Very cool. Jeff Lewis is a genius....he used to do this show called Interior Therapy with Jeff Lewis. He does a design makeover for these dysfunctional couples. He ends up giving them a bit of therapy as well...think you can find it on Netflix...and it's hilarious. Worth a watch. Huh. Will go check out Netflix. My friend said "he is a genius." I watch Flipping Out, I think he is hilarious, albeit he has seriously twisted sense of humor! I remember that episode, but I didn't know it was you! Congratulations on your 1 second of fame! That's more than a lot of people! (In Elvis accent) "Well thank ya, thank ya very much!"